Title: 12/16/1992 - Alarm systems for employee evacuation and/or response. This is in response to your letter dated March 10, and our meeting of June 16. We regret the delay in responding to your letter. Your letter contained many detailed questions concerning compliance with various Occupational Safety and Health Administration (OSHA) standards which require alarm systems for employee evacuation and/or emergency response. We will first discuss the broader issues on compliance alarm systems, and then address your particular question in the order they were asked. The language of the standards you referenced is performance oriented, which means that their requirements depend, to some extent, on the circumstances of the particular worksite. There is a broad array of facilities to which these standards apply and consequently a broad array of systems which would be deemed in compliance; i.e., not cited by a compliance officer in the course of an inspection. The complexity and sophistication of the alarm system required depends on the number and size of operations and the associated degree of hazard for a given facility. A small, single-process plant may only require a simple siren to call for evacuations. In a larger more complex facility, where multiple contingent responses or multiple contingent evacuation routes may be required of employees, the alarm system should convey clearly the information necessary to allow employees to respond or evacuate in a safe and appropriate manner. 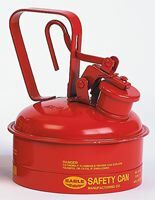 Depending on the facility, this may require communicating the location of the release, the type of the release (i.e., vapor, gas, liquid), the ambient conditions that may affect response or evacuation options, and ultimately, which contingent response or evacuation procedure is to be followed. 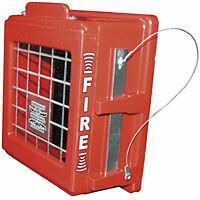 We have all kinds of fire alarm signs and accessories at Safety Emporium. The level of training required for employees regarding the alarm system increases directly with the complexity and sophistication of the system. Training would be required to cover how and what the alarm system communicates to employees during an emergency. A facility, although having an adequate alarm system, and found to be in compliance with all of the pertinent OSHA hardware regulations, may not have trained its employees in the proper contingent responses indicated by the alarm system. This would be a deficiency in the required training program (e.g. 29 CFR 1910.1200(h)(2)(ii) or 1910.120(q)(6)), and would be so cited by OSHA. OSHA does not certify alarm systems as to their "meeting compliance". The employer is responsible for analyzing the circumstances of the facility and choosing a system that meets the requirements of the law. OSHA will provide guidance and interpretation as to the standard's intent; however, OSHA does not endorse any products nor design systems. OSHA concurs with the three stated "Alarm system function and performance requirements" on page 2 with the substitution of "emergency action plan or emergency response plan" for the phrase "emergency response plan" in point #3. 2. Are the statements in the [following section] correct? For sites where different types of emergencies or ambient conditions could occur which would require differing responses or evacuation procedures, the emergency response plan (ERP) or emergency action plan (EAP) must address the required contingent actions. However, some larger - and many smaller - facilities may have only a few hazardous substances and have the same ERP or EAP for all scenarios or emergency situations; i.e., hazardous substance release, fire, etc. In this case, a single siren or alarm may be appropriate. Fire alarm covers can reduce vandalism, tampering, and false alarms. Get yours at Safety Emporium. 1. The employer should also develop and explain in detail what rescue and medical first aid duties are to be performed and by whom. All employees are to be told what actions they are to take in these emergency situations that the employer anticipates may occur in the workplace. 2. Emergency evacuation. At the time of an emergency, employees should know what type of evacuation is necessary and what their role is in carrying out the plan. In some cases where the emergency is very grave, total and immediate evacuation of all employees is necessary. In other emergencies, a partial evacuation of nonessential employees with a delayed evacuation of others may be necessary for continued plant operation. In some cases, only those employees in the immediate area of the fire may be expected to evacuate or move to a safe area such as when a local application fire suppression system discharge employee alarm is sounded. Employees must be sure that they know what is expected of them in all such emergency possibilities which have been planned in order to provide assurance of their safety from fire or other emergency." Emergency response regulations contain plan elements stipulating evacuation and escape procedures, and mitigation procedures to be carried out by non-evacuees. These are located in 29 CFR 1910.38(a)(2) and in 29 CFR 1910.120(1)(p) and (q). It is pertinent to note that 1910.38 "Appendix to Subpart E - Means of Egress" is a nonmandatory guideline to help employers understand the intent of the standard. Where emergency action plans are required by particular OSHA standards, employees must be notified of their expected duties during an emergency before the emergency occurs. This notification must be preplanned before the alarm ever goes off. Employees must know where the predesignated places of refuge are, although the alarm system should assist employees in determining where to go, and where not to go, during the emergency. 29 CFR 1910.165(b)(3) states: "The employee alarm system shall be distinctive and recognizable as a signal to evacuate the work area or to perform actions designated under the emergency action plan." This portion of the regulation emphasizes the need for the signal to be "distinctive and recognizable". Following is an excerpt from 29 CFR 1910.165 "Summary And Explanation of Final Rule:"
Section 1910.165 Employee Alarm Systems paragraph (b)(3) of the proposal provided that employee alarms be distinctive and recognizable to employees as signals to perform actions designated in the emergency action plan. OSHA has decided to adopt the proposed language with minor corrections as the final requirement. In addition, OSHA does not intend that the final requirement mean that each signal must be generated by a separate device or system; rather, OSHA will recognize a single system with distinctive code signals or a voice communication system. At those sites where the emergency response plan contains multiple contingent responses the alarm system must provide distinctive and recognizable signals as necessary for proper action as designated in the emergency response plan. The "Employee Alarm Systems" standard requires employers to design a system, appropriate for their workplace, that must provide warning for necessary emergency action. For facilities that have developed several contingent responses or evacuation procedures, the alarm system "must provide distinctive and recognizable signals as necessary for proper action as designated in the emergency response plan." A scenario in which an emergency response plan has the potential of instructing an employee to move into a danger area during an emergency would not be in compliance with OSHA standards. Depending on the circumstances, it could result in a citation of any one of the standards and specific provisions you listed, or the general duty clause of the OSH Act. In general, this type of scenario would probably result in citations of other provisions of OSHA regulations, such as 1910.38, 1910.119 or 1910.120, not just those requiring alarm systems. For example, facilities falling under the scope of the Hazardous Waste Operations and Emergency Response standard (29 CFR 1910.120), would most likely be cited for an inadequate emergency response plan, 1910.120(q)(1), or inadequate preplanning, 1910.120(q)(2)(i) or inadequate evacuation routes and procedures 1910.120(q)(iv). Please see the response to question #3. The alarm system you describe in scenario #5 conveys the minimum information necessary to all affected employees, allowing them to take the correct contingent evacuation or response action in the event of an emergency. This alarm system would meet the intent of OSHA standards and therefore, would be found to be in compliance with all of the standards and individual provisions listed in your letter. This response merely refers to the alarm system, not to other aspects of emergency response or evacuation. As stated above, the complexity and sophistication of the alarm system is a function of the complexity and sophistication of the facility. The standard's performance-oriented language requires that the "warning" and "notification" be communicated through the alarm system or through some other form of communication (i.e. verbally at muster points) in order to allow adequate "reaction time for safe escape of employees from the workplace or the immediate work area". In your first example in Figure 6 you indicate that all employees are given notification and warning in sufficient time to escape before the "critical moment", which you define as the point at which the emergency becomes injury- or life-threatening. This would meet compliance with the intent of the standards and provisions you listed. The following two examples have the alarm system, ERP or EAP affording communication of the "warning", which you define as "the information required for an employee to select an appropriate response", either at or after the "critical moment". This would expose employees to an injury- or life-threatening situation because the warning comes too late. Therefore, examples 2 and 3 would, depending on the specific circumstances, constitute violations of the standards and provisions which you listed. OSHA recognizes that there may be emergencies in which the alarm is sounded after the critical moment for a certain group of employees in the immediate incident area. The alarm is intended to warn others more remote from the incident. For example, a fire or explosion may occur followed by an alarm to warn others to take action or evacuate. This is not a violation of the standard. OSHA concurs with your statement that the language of 29 CFR 1910.165(b)(1) creates a performance standard for the amount of time allotted for the alarm system to accomplish its task. Alarm systems must inform employees not only that an emergency exists, but where contingent responses or evacuation procedures are in place, what they are expected to do in response to the alarm system's warning. This information must be relayed by the alarm system to the employee in sufficient time to provide for reaction time for safe escape of employees from the workplace or immediate work area. Yes. For systems not having a battery back-up, the use of an alternate source of power such as a generator or noninterruptable power supply would be necessary. Manually operated actuation devices, such as pull boxes, are not required but if used must be evident and readily accessible. Yes, the telephone is an acceptable alternative to the use of manually operated actuation devices. No, the communication device need not be supervised. Your interest in insuring a safe and healthful workplace is appreciated. If you have any further questions please feel free to contact [the Office of General Industry Compliance Assistance at (202) 693-1850].